Southern elephant seals (Mirounga leonina) are large, potentially dangerous animals which must be restrained before study or treatment. However, chemical restraint is unpredictable, possibly because of differences in body composition during fasting ashore, and circulatory adaptations to enable diving. 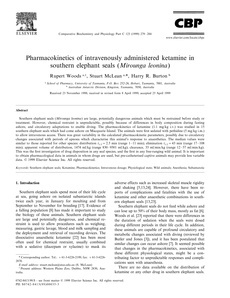 The pharmacokinetics of ketamine (1.1 mg/kg i.v.) was studied in 15 southern elephant seals which had come ashore on Macquarie Island. The animals were first sedated with pethidine (5 mg/kg i.m.) to allow intravenous access. There was great variability in the calculated pharmacokinetic parameters, possibly due to circulatory changes associated with periods of apnoea which characterise this animal's response to anaesthetics. The median values were similar to those reported for other species: distribution t1/2 = 2.5 min (range 1-11 min); elimination t1/2 = 43 min (range 17-108 min); apparent volume of distribution, 1474 ml/kg (range 830-9301 ml/kg); clearance, 33 ml/min/kg (range 12-57 ml/min/kg). This was the first investigation of drug disposition in any seal species. and the first in any free-ranging wild animal. It is important to obtain pharmacological data in animals in whom drugs are used, but pre-catheterised captive animals may provide less variable data.